Based on our experiences at the Chinese Consulate, it should have been obvious that Beijing was not going to welcome us with open arms. Even before arriving, the haughty city had made it clear that we were only to be visitors there, and it reminded us of this every chance it had. As the swanky Emirates airbus began its descent, a smiling flight attendant glanced at the two piles of arrivals cards she held and immediately handed me one labeled “For Aliens.” I took a moment to ponder this. Being an English teacher, I harbor an immense respect for the English language and its use, and thus feel that diction plays an essential role in how a message gets across. During my travels, I’ve taken on many different roles, such as Visitor, Tourist, Expat, or even the less amicable title of Foreigner. But Alien? This was a first. China seemed to be suggesting that I was not merely a visitor or tourist arriving from a foreign country, but an extraterrestrial entity who would have absolutely nothing in common with the country’s residents, arriving only for a brief probe or to abduct some unassuming Chinese livestock . As I wheeled my suitcase into the appropriate customs line and joined the cluster of other aliens, I wondered exactly what sorts of obstacles we would face in a country that viewed us more as interlopers than visitors. It really shouldn’t have come as a surprise, I thought, lingering behind a trio of Egyptians holding up Passport Control. Here was a country that was historically synonymous with the concept of keeping foreigners out: it built a massive wall just for that purpose. Yes, while other countries seemed content with cartographically-enforced borders, China felt the need to take it a step further and erect a wall, just in case the rest of the world didn’t get the hint. Add to that the fact that China didn’t really open its doors to the rest of the world until the early 19th century. Again, it shouldn’t have come as a surprise. It wasn’t until we reached the taxi queue that I realized the extent of our unpreparedness for this trip. Though the Great Wall was certainly a formidable obstacle in its day, there exists in present-day Beijing an even greater barrier for ignorant alien visitors: Mandarin. In a characteristic moment of naivety, I thought I could simply present the address of the Beijing Drum Tower Youth Hostel to the information attendant and she would laugh, understanding, and cheerily point us off in the right direction. Not quite. Instead, she flagged down various passers-by until one proved able to translate the address into the appropriately corresponding characters and sent us on our way. A 600 CNY cab ride later, the three of us stood waiting in the lobby of a youth hostel while stray dogs ventured in off the streets to nap on the couches. When Chantelle and I were finally shown to our room – Loraine had offered to occupy a bunk in the shared dorm –, we dropped our belongings and scoped out the shared toilets. 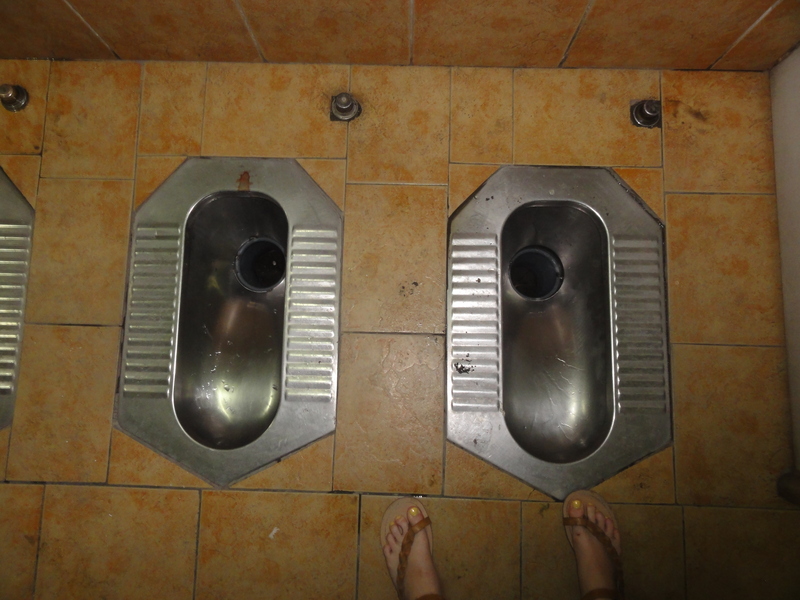 To our dismay, we found two options: proper toilets, both clogged with tissue and rancid with the stench of urine, or a hole in the ground. And while the shower can sometimes serve as a viable option as well, these showers were paradoxes in that they were not so much places to get clean as they were places to contract tetanus while getting dirtier. Modeled after the primary setting in Saw, the showers presented a real challenge in that they stood in the way of washing. I resolved not to use them, and spent the first four days in Beijing with unwashed hair. “Maybe we should go somewhere else, or upgrade,” Chantelle suggested as we got ready that night. “This is absolutely disgusting,” I agreed. In fact, the only one of us who seemed nonplussed with the whole arrangement was Loraine, who was sharing her four-bunk room with a strange Chinese man. Loraine’s room had its own bathroom, but it also had a persistent dank and musty stench that lingered in the bedroom. Loraine didn’t seem to mind, though. 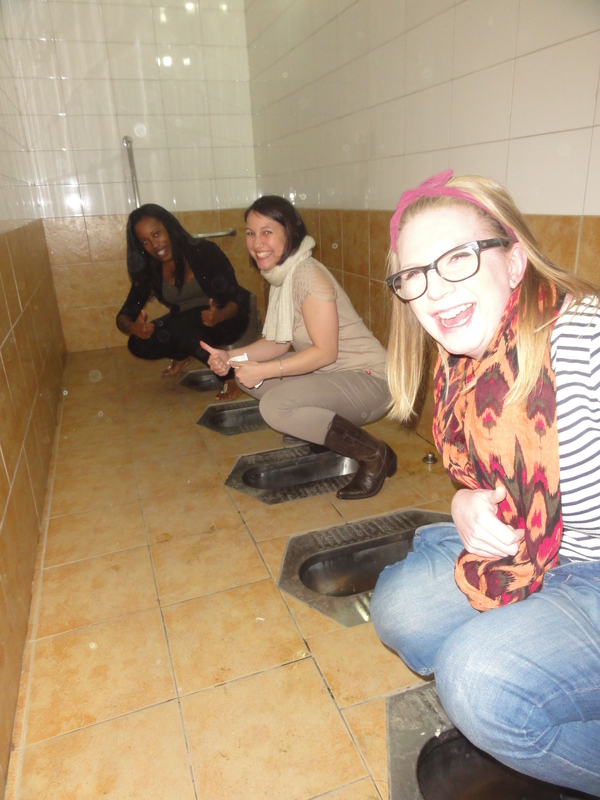 That night, we also discovered that Loraine was indifferent to Beijing’s public toilets. After dining on dumplings courtesy of Valiha and Judson, we ventured out to indulge in Beijing’s nightlife. A few imported beers in, we sought out a toilet with Valiha. I’m not sure what I was expecting, but it wasn’t anywhere near what we found instead. Around a stone wall was the ‘bathroom,’ which was really just a few meters of tile and six or eight holes in the floor. No partitions blocking off the holes, no toilet paper, no sink, no useful sanitizer dispenser. “It took me a while to learn how to squat without taking my pants all the way off,” Valiha confessed as we stood in the road, stretching our legs and wiping our hands on our jeans. “Are all of the bathrooms like this?” I asked incredulously. “That’s disgusting! I can’t use these!” Chantelle cried. I fervently nodded my head in agreement. Valiha laughed, and Loraine shrugged. “Ach, it’s not so bad,” she admitted. For the duration of the trip, Chantelle and I carefully monitored our fluid intake and timed our beverage purchases to revolve around the presence of proper, ‘western’ bathrooms. Loraine maintained an air of boredom about the whole endeavor, as if urinating in a hole in the road was as reasonable a thing to do as going to the gym or driving a car. I began to think that Loraine was a bastion of patience, a steely Scot with enviable versatility. But Beijing was about to test our patience, and as we would soon discover, despite two years in trying Cairo, we were not nearly as patient or yielding as we’d thought.